It doesn’t matter what you think about the protest against tuition fee hikes, this isn’t about accessible education anymore. 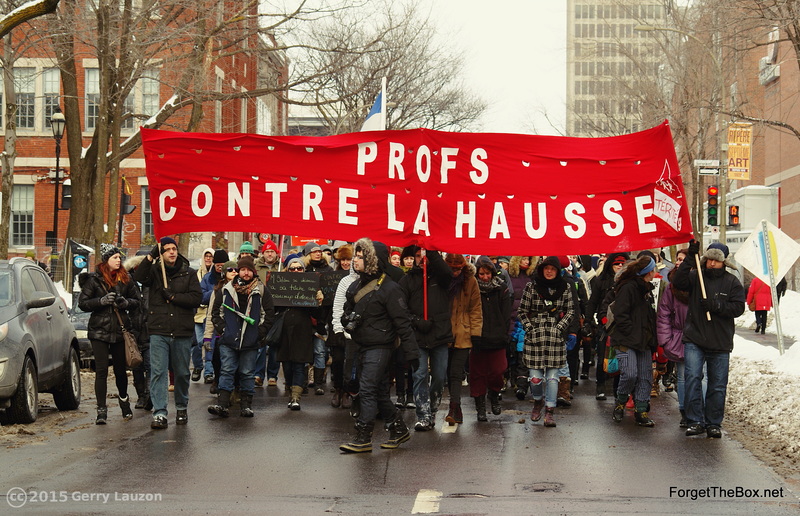 Now, everyone in Quebec’s right to protest, organize and express themselves freely is at risk. As of last night, people’s right to just go out and have a good time is at risk, too. 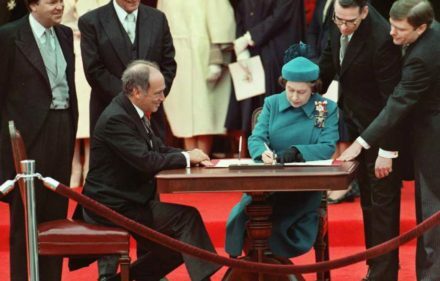 Friday, after a last-minute 48 hour session of the Assemble Nationale, the Charest government passed Bill 78. This “special” law originally defined any gathering of ten people or more who had not provided police with a trajectory and duration eight hours prior as an illegal riot. That figure got changed to 50 people. The original number was laughable and prompted tongue-in-cheek phonecalls informing the police of upcoming family gatherings as well as satirical observations that people waiting for a bus, for example, could constitute a riot. Any number imposed as a limit, though, is unconstitutional and oppressive. The law also makes it illegal to protest within 50 meters of a school, effectively barring protests from Montreal’s downtown core. Not only that, Twitter is apparently under surveillance, too. People’s tweets in favour of the strike protests or critical of the new law could land them in trouble for being a protest organizer. In a nutshell, this is the most repressive piece of legislation passed in Canada since the War Measures Act. It’s a desperate act by a desperate administration trying to hold on to authority. Unfortunately, everyone has to pay for that desperation. The student movement is locked down, so is any other movement that wants to get their message out in public space. A chill is being felt all across Quebec. 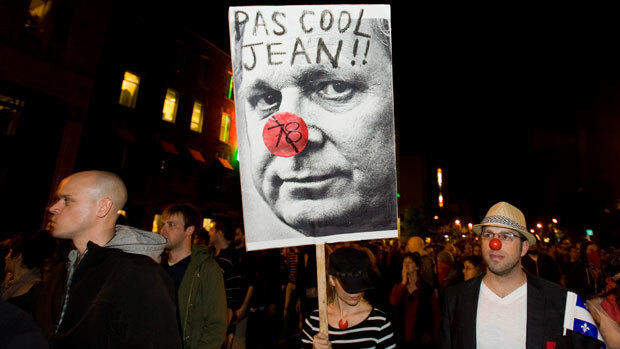 Charest can now pass whatever he wants without having to deal with the consequences. Well, not quite. If you were out in downtown Montreal Friday night, it didn’t look like any activists were in hiding. Protesters responded to their right to protest being removed by, well, protesting, in larger numbers than before. Some media said there were 10 000 people in the streets, others online argued that the figure was way higher. To be safe, I’ll just say that there were more than 50. And that’s the point. Way more than 50 people marching without providing police with a route eight hours in advance by all the major schools in the downtown core and tweeting about it. That’s the only kind of response that will work, direct, point-by-point defiance. And it was, for the most part, peaceful. Yes, there was a brief exchange of molatov cocktails and teargass and the cops declared the march illegal (kinda pointless, really, given the fact that all marches like this one are now technically illegal from the get-go), but as tens of thousands of people marched on, that passed and the protest continued until around 2am. Last night wasn’t so jovial. The SPVM not only arrested 69 people, but they also teargassed a terrasse full of bar patrons unrelated to the protest on St-Denis (and even arrested a random woman). When the cops erected a barricade, quite possibly to kettle people in and arrest them, protesters set it on fire. 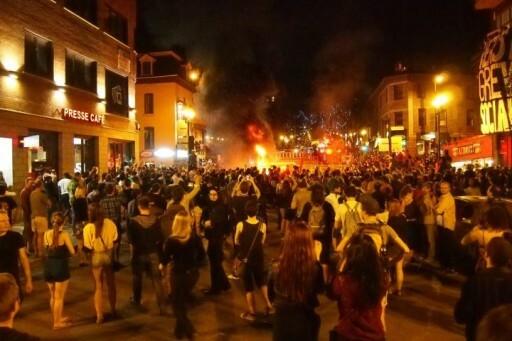 Regardless of whether or not you think going all St-Jean on the barricade was a good idea, I think we can all agree that the right course of action by the authorities would have been to put the blaze out right away. Instead they let it burn for a while, just enough time to get headlines about protesters burning things into the major corporate media. It was for effect. Just as the attack on random Saturday night drinkers was for effect. Sure, they may explain it away as being some rogue cop acting inappropriately, but I think the real motive is to let people know that if the protests continue, they too may become a target. The problem for them is people aren’t stupid. We’re savvy around these parts. We know that with this law, we are all targets automatically. Because of law 78, this is no longer just a student struggle. It’s everyone’s struggle. Unions are coming on board and there’s a major march planned for Tuesday. Opposition politicians are urging civil disobedience and asking if the government has lost its mind. Xavier Dolan brought the movement to Cannes. The Arcade Fire brought it to Saturday Night Live. Ordinary people are waking up, too. 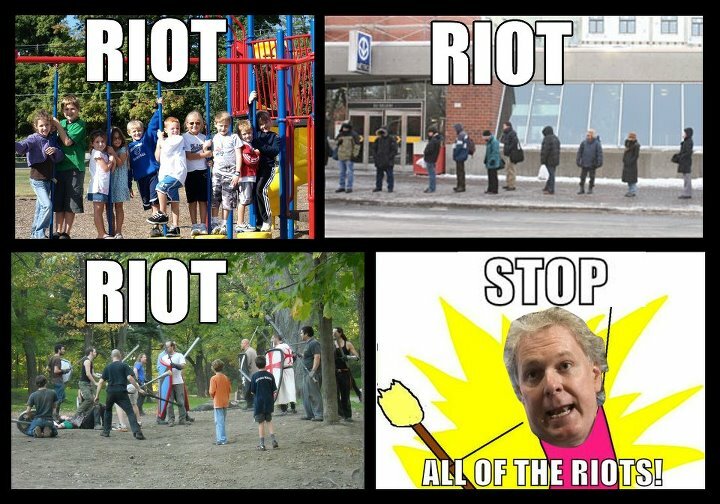 Jean Charest woke them up. I don’t think they will go to sleep until this law is removed from the books. At least I hope they won’t. We can’t afford to lose our most primal political rights. We are all red squares now. Previous storyArugula Parsley Pesto: A Green Raw Boost!